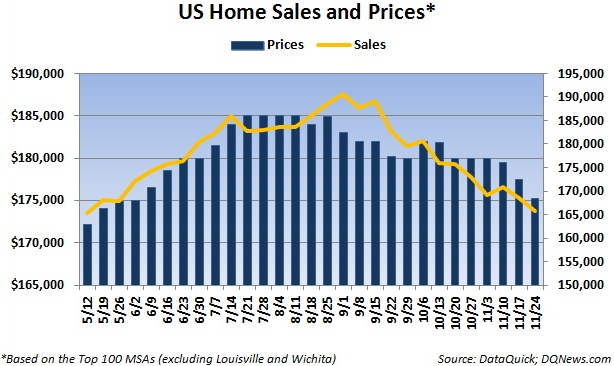 Weekly existing home sales volume continued downward last week falling to levels last seen in the middle of May according to the National Home Sales Snapshot released by DataQuick. There were 165,729 properties sold over the previous thirty day rolling period ending November 24, down 1.7 percent from the previous week’s total of 168,511 properties sold. Sales are down 4.2 percent in the last month. Last week’s home sales volume was still 2.0 percent higher than the 162,468 homes sold during same period a year ago but was down 9.9 percent from the same period three years ago when 183,837 homes were sold. The median price of a home sold over the previous thirty day rolling period ending November 24 decreased 1.3 percent to $175,250 from $177,500 the previous week. Home prices have fallen 2.6 percent in the last month and are only $5,250 away from reaching the five year low. Home prices were 7.8 percent lower than the same period a year ago when the median price of a home was $190,000 and were down 18.5 percent from the same period three years ago when the median price was $215,000.